In the South, dessert is the highlight of every occasion. From birthdays and weddings to holidays and daily supper, no gathering is complete without a sweet ending. 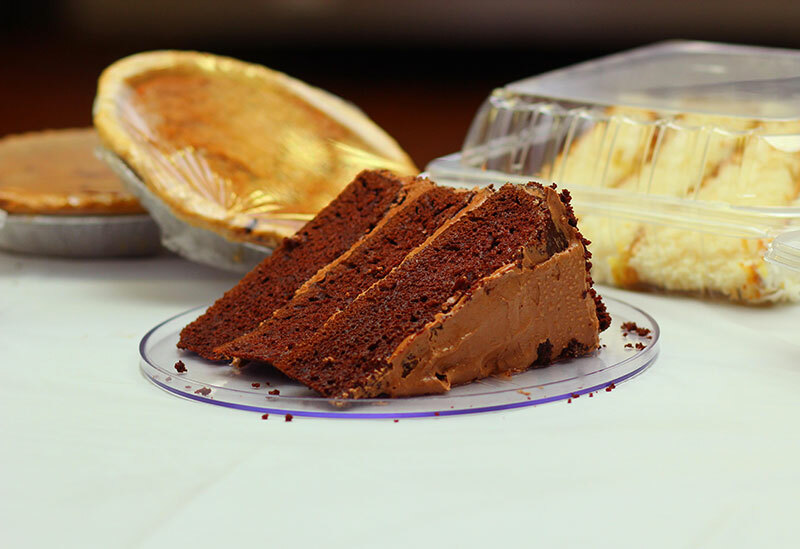 Indulge your sweet tooth by ordering dessert from the bakery at Down Home Delivery & Catering. We offer a variety of freshly baked and prepared dessert items prepared weekly by our baker at our restaurant at 2 Bowdoin St., Dorchester, MA. We offer magnificently frosted layer cakes like Pineapple Coconut, Chocolate Fudge and, a Southern favorite, Red Velvet. Luscious homemade banana and bread pudding and humble fruit filled cobblers like peach and apple. Sweet potato and bourbon filled pecan pie are southern favorites and we whip them up weekly. Our lemon pound cake tastes like fresh squeezed lemonade and is a customer favorite of which we can never seem to make enough. A complete list of the desserts we offer can be found in our catering menu. Pictures of some of our desserts can be seen in the Food Gallery. No matter the occasion, order your dessert from Down Home Delivery or come visit us and select from our daily dessert offerings. Let Down Home Delivery help you make sweet memories throughout the year with those that you cherish the most.